3232 SPE PANAMA (1915) Palace of Arts*. Specimen overprint with control punch. Scott No 209, Yvert No 111. 4443 SPE PANAMA (1936) Urraca monument*. Specimen overprint with control punch. Urraca was the most famous chief of the Guaymi tribes who defeated the Spanish several times. Scott No C21, Yvert No PA20. 4530 SPE PANAMA (1936) Palace of Justice*. Specimen overprint with control punch. Scott No C26, Yvert No PA25. 4548 SPE PANAMA (1941) Map of Panama*. Plane*. Set of 3 with specimen overprint and control punch. Scott Nos C6a-c, Yvert Nos PA66-8. 3013 SPE PANAMA (1942) Farm girl*. Specimen overprint with control punch. Scott No 343, Yvert No 234. 4124 SPE PANAMA (1942a) Flags of Panama & Costa Rica*. Specimen overprint with control punch. Scott No 341, Yvert No 232. 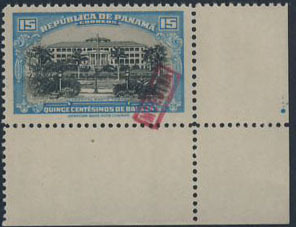 7593 SPE PANAMA (1942) St. Tomas hospital*. Issue overprinted "Specimen" in red box. These stamps were a special order for government display. Only 20 copies exist, four of which were kept by the Panama government. Every stamp was signed on the back by Sanabria and Kessler. Very rare! 4750 SPE PANAMA (1955) Excavation*. FIPEX issue overprinted "Specimen" in red box commemorating the first excavations of Panama Canal and 150th anniversary of the birth of Ferdinand de Lesseps. These stamps were a special order for government display. Only 20 copies exist, four of which were kept by the Panama government. Every stamp was signed on the back by Sanabria and Kessler. Very rare!